While not a quite a Pelikan, it looks like the bluebird of happiness may have just landed for some. Hannover may have gotten off to a late start but they are wasting no time in giving us a few rapid fire releases. Just forty-eight hours after news of the M600 Turquoise-White broke, we now get our first glimpse of the upcoming M120 Iconic Blue. This is a follow-up to the M120 Green-Black which was re-issued back in early 2016. Both of these models draw their design from the tried and true lineage of the original 120 that was made from 1955-1965. While many similarities exists between old and new, these modern versions certainly stand out on their own and make for excellent and dependable writers that are true to their school pen roots. Availability is anticipated for some time in March of this year alongside the M600 Turquoise-White. This M120 will break new ground as the original only came in Green-Black. The barrel of the forthcoming model appears to be done in a deep shade of blue with a matching transparent ink window. The section, piston knob, and cap match the barrel resulting in a monotone appearance that is none the less striking. The furniture is gold-plated with a single cap band and the traditional pelican’s beak clip. In keeping with its humble origins, you will not find additional trim rings adorning the body or section. The cap will sport the current single chick company logo and the nib will be gold-plated stainless steel. Nib widths will come in the standard sizes of EF, F, M, and B. 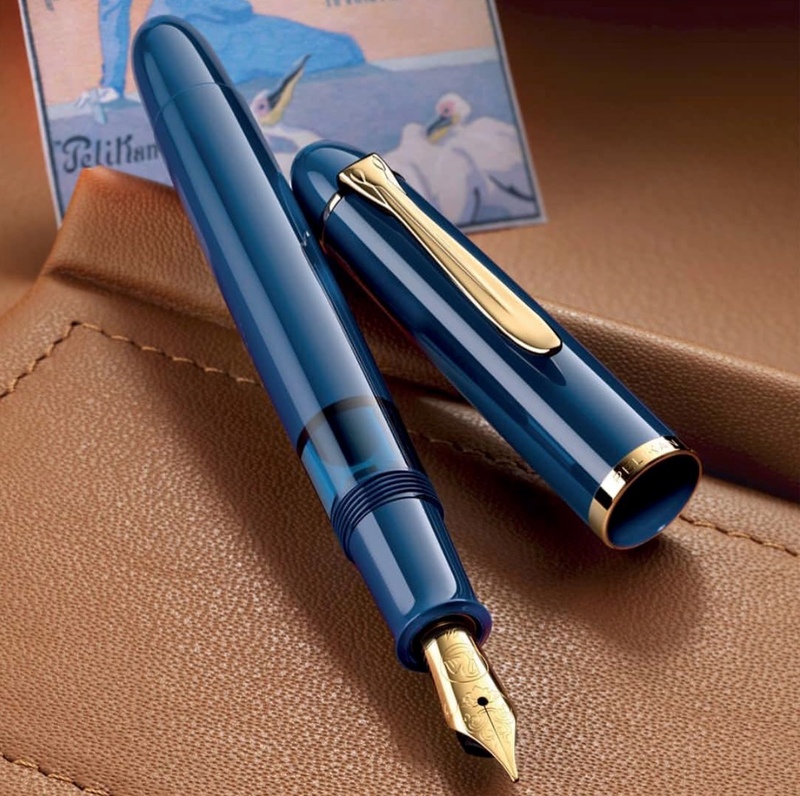 Just like the 2016 re-issue of the M120, the nib of the Iconic Blue will feature the same unique engraving that adorned the prior release. 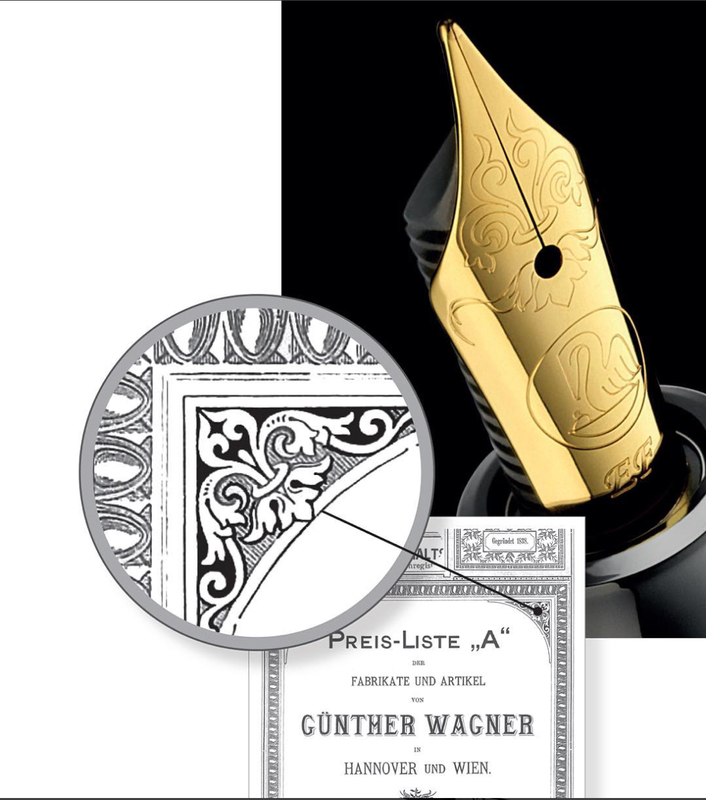 If you’ll recall, that engraving is purported to have been inspired by a bit of flourish taken from a historic Günther Wagner price list. Like its predecessor, this iteration will come in a historical gift box with a special edition bottle of ink. There will be no matching ballpoints or other writing instruments with this one. As an aside, I wonder whether or not the available product shot might give some insight into the inspiration for this particular model. If you look closely at the top half of the full rendering depicted below, you will see a poster advertising Pelikan’s water colors. It was designed in 1899 by Käthchen Münzer as part of a sponsored competition. The advert depicts a lady in a blue dress with some pelicans sitting beneath an umbrella. This poster is of particular significance because it was during this competition that the traditional styling of the “Pelikan” mark in the logo first shows up. The re-issued M120 is a great writer and I enjoy my copy of the 2016 release tremendously. I reviewed it at the time which you can read about here. The biggest detractor of that pen, for me, was the price which seemed grossly out of line for what was essentially a school pen equipped with a stainless steel nib. There are no figures yet available on US pricing for the Iconic Blue but some overseas vendors are offering this model for €195 (~$241.94) with VAT. That would come to approximately €159.84 (~$198.32) excluding VAT for US customers purchasing abroad. Remember that, if purchasing from overseas, there is now a premium to be paid for EF nibs beyond what is quoted here (add ~€16-20). If we see similar or higher pricing for this model compared with the 2016 release then, in my opinion, that does a great disservice to the Iconic Blue. Still, it is a great looking blue pen with a classic and pleasing shape backed by Pelikan dependability. What are your thoughts on this one and do you think that you’ll be picking one up? I hear that quantities will be limited so, if interested, it may be best to jump on this one early. *Pricing reflects pen with ink and gift packaging. US MSRP without ink or gift packaging is $235 with a retail price $188. Update 2/20/18: Post updated with the US MSRP and retail pricing which appears to be unchanged from the Green-Black model of two years ago when purchased in the gift set. It looks like Chartpak is also offering this model to its US vendors sans gift packaging for a reduced cost which is nice for those who have no interest or need for such things. Love the color, not the price. Not at $200. $140-$150 maybe. I think $140-150 would be a reasonable price point. I picked up the 2016 model for about $150. Anything more seems gratuitous for what it is and can’t help but seem a little like Pelikan taking advantage of their customers. Of course, value is subjective so this is my own personal opinion only. Given this pen’s timing and motif, isn’t the ‘Iconic Blue’ Pelikan’s answer to Platinum’s charming ‘Chartres Blue,’ only downgrading the nib from gold to steel (at twice the price & equal quality)? This is admittedly a very handsome pen, perhaps ever so slightly more than the Chartres Blue. And for 15 years a Pelikan M250 (now w/M400 2-tone F nib) has been the fountain pen I reach for, but if I am to fall for a beguiling iconic blue FP, it will likely be the gold and blue of Chartres. Until relatively recently, US$100 was a stratospheric ceiling for a steel nibbed FP; I remain a subscriber to that tradition. I don’t think that Pelikan plays at keeping up with others. I’ve never seen any of their releases as a response to the moves of any other manufacturer. I agree that the pricing is a bit high but you can get these for $150 which makes them a bit more palatable, especially given their great look. Timing? The Chartres Blue has been out for several years now. There are a number of other $100 or $150 steel nib pens out there. Pelikan isn’t the only company ‘guilty’ of that. The 3776 is one of the better values out there. Despite the steel nibs, I still think the same of most of Pelikan’s 2XX series pens. The Queen Elizabeth II could not turn on a dime. Such a departure from venerable tradition, conception to presentation, could take time. I accept on faith that the steel nibs live up to Pelikan’s reputation, yet an ounce of steel will buy you hardly a speck of gold. Does noble Pelikan’s joining a crowd of providers who charge $100 and more for steel nibbed pens bring us to the threshold of justification? The exquisite beauty and integrity of the M800 Raden Royal Gold, however, would cover a multitude of sins. Well said. I agree with all of your points. It is a shame that the pricing for so many steel nibbed models has gotten out of hand. Pelikan is one of the more tolerable for me on this point because of the piston filling mechanism. I think I’d feel that way even if it wasn’t my favorite brand. Good point. To develop and produce a new pen does take time. Still, I see no evidence that this new 120 has anything to do with Platinum’s Chartres 3776. It is an interesting question as to what justifies $100 or $150 for a pen with a steel nib. I imagine there would be a number of different answers on that. Some, of course, would say that they simply won’t ever pay that much for steel nib pens. Surely it’s wiser to never say such a ‘won’t ever’ where Pelikan is concerned. I doubt I have ever seen an equally attractive blue pen. If any incongruity weren’t soon forgotten, one could always replace the nib with one more befitting the dignity of its station. 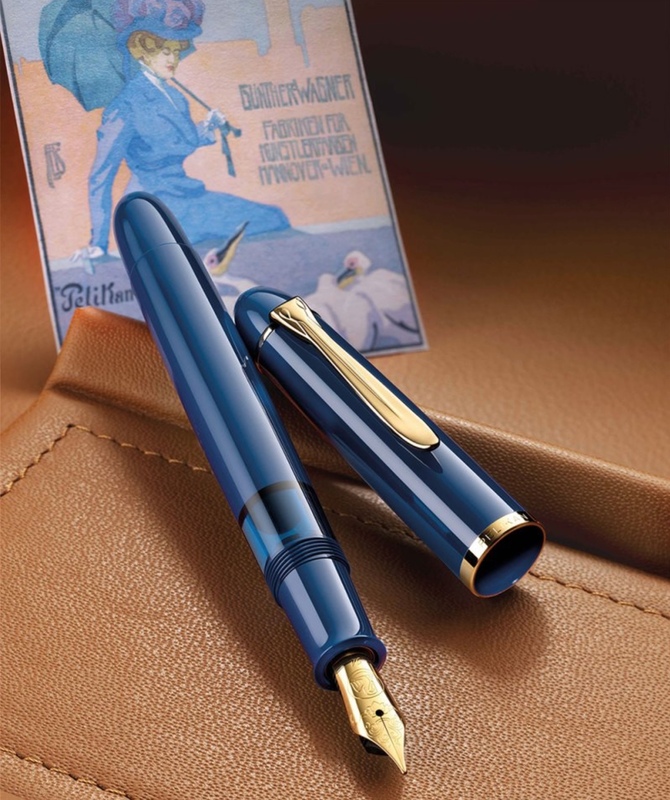 And agreed, Pelikan stylists are certainly astute enough to independently recognize a current fountain pen niche: iconic deep blue with gold appointments in a modest sized cigar shape. There seems to be a healthy market for these modern retro inspired pens. From idea to production, it takes about two years for a new Pelikan to appear on the market according to one source that I’ve read. Hey, Joshua – I totally agree with you on the pricing. I really like the blue, and the engraving on the nib is beautiful. I also like the way they have revisited the past with these models. Pelikan’s stainless steel gold-plated nibs often write with more character than their solid gold nibs. I’m seeing a lot of features to like with the new Iconic Blue, not the least of which is the beautiful blue color with the gold trim. However, I probably won’t be buying this one. It’s just not worth what Pelikan wants for it. Especially not when I can spend the same amount (or even less) and get a high quality fountain pen with a 14K nib. I’m not a gold nib snob; I like stainless, especially Pelikan’s stainless. But it’s just not worth close to $200 to me. I agree with all of your sentiments Debi with the exception that I’m sure one will find its way into my flock. I really like the Green-Black and this color is even better than that one. Well, I made a liar of myself. Seems like everywhere I looked (pen websites; my fault), I kept seeing that pen! That beautiful blue color seduced me. So, I pulled the trigger. I’m really looking forward to getting it. Plus, I’m hoping that stainless steel nib will live up to Pelikan’s reputation. Now I’m waiting on this one plus the Turquoise M600. The anticipation just makes the appetite sharper! I don’t think you can really be a liar since I never believed you. This one is hard to pass up. It’s a beautiful blue. Congrats on the addition(s) to your flock! Ohhhh, you! Very funny. You know me better than I know myself when it comes to Pelikans, it seems. -lol- I should’ve known better than to make any negative declarations when I saw that blue. After all, blue is my favorite color – what was I thinking? Well, I pulled the trigger and got the M120 Iconic Blue. I was going to get it with the steel nib; however, in the end, I couldn’t resist an upgrade. I got it with an M400 nib. I didn’t have it reground to a stub like I often do; I got a Broad nib and had it tuned. And I have to say, that is one of the sweetest-writing pens I own! When I pick up that pen, I don’t want to put it down. I have sat and written pages and pages with it at one time because it is so enjoyable. (I got it at nibs.com and it was tuned by Jessica, who I believe is John Mottishaw’s newest apprentice.) What can I say? My wallet is screaming, but I am loving that pen. Congrats on the new pen. The Iconic Blue looks great and is certainly hard to resist. Enjoy it! I’ve got to agree: pretty pens, ugly price. And for a steel nib it is pretentious, no, preposterous. I’ve come to really like the modern design and that rounded shape on any pen has never really appealed to me. Although this is an attractive pen it’s not so much so that I need it. The turquoise 600 is much prettier but I won’t get that one either. Still working off the glow of the red stripe 800 and the ocean swirl that made it to my desk in recent months. Hard to be wanting when you have two great pens like that on the desk. Still, Pelikan seems to continue to find a way. Well. Similar to Debs comment earlier this pen has grown on me and now I want one. With a birthday in a few weeks I am pretty sure I know what I’m spending the check from my mom on. Happy early birthday. You could do a lot worse than an Iconic Blue. The M120N is a light pen but a great and dependable writer and I really love the blue of this one. Surpasses the green-black in my mind. It’s a very simple, very functional look and these nibs write well. I’m sure this will sell out but I can only imagine how many more units they could sell if it was given a price more fitting of its station. Thanks Joshua. I think I prefer this to the turquoise 600 – and liked the nib on the green and black M120. Might get it if there’s a good deal, but it’s not a must-have. That was exactly how I got the Green-Black. I wasn’t going to pay retail but I came across a deal which I couldn’t resist. Very happy that I did. Hopefully similar deals will be found with this one. This looks a gorgeous colour. I have so far resisted the green and black version but this one looks even more tempting. Will add it to the wish list and see how it is priced here in the UK. Recent issues with Pelikan’s product photography has me holding out final judgement until we see some real world examples but if it’s anything like that blue in the photo, I think they nailed a very compelling color. blue was always the most valuable color of the original models. Very interesting that that’s what Pelikan went for with this latter day reincarnation! I think that you may be confusing the 120 with the 140. The 120 only (originally) came in Green-Black. The Merz & Krell reboot of the 1970s added a black variant though this differed from the original in many ways. The 140s came in a variety of colors including blue, green, burgundy, and more. Easy to confuse as they have a very similar size and shape. The biggest difference I guess is that one was a stainless steel nibbed school pen and the other a 14C gold nib targeted more towards adults. I really love the color. The green black was a nostalgic touch but this I find exciting. Will wait a bit to see how the actual pen looks, but I am already making a place in my collection. My only wish would be for a stub nib, but perhaps the broad will be a bit stubby. I don’t find the bolds to be overly stubby but a nibsmith could fix that up for you no problem. This looks like it could be an interesting shade of blue. The first shade that came to my mind after seeing the pictures was Diamine’s Kensington Blue. I do look forward to seeing what they actually look like in person. These pens have the same vintage 140/400 and modern 400 nib compatibility as 200 series pens, right? The M120 will accommodate M2xx, M4xx, and 140 nibs without an issue. 136,- € (146,-€ for ef) is the price in Germany with VAT. Thanks for sharing Marta. Fritz-Schimpf is my personal go to retailer as they usually offer very competitive pricing and excellent service. It’s looking like Germany’s pricing is well under the available Italian prices that I had quoted in my post. I guess prices will run the gambit on this one so it may pay to shop around. FYI – Pen Chalet offered a price slightly lower than the Fritz-Schimpf price, same base price of US$141, but including the intern’l shipping cost of US$30 instead of Euro$30, which I trust was intentional. Thank you for sharing. I’m sure that information will prove very useful to some. I have come to believe that in the race to get the best deal, it is sometimes worthwhile to make some small compromises in order to establish a relationship with a retailer. Such a connection can be well worth the the small variation in prices. Agreed, wholeheartedly. If one has established good relations with a retailer, the value of loyalty leaves this price difference unworthy of mention. I have not done business with Pen Chalet or Fritz-Schimpf, but my scruples about steel-nibbed Pelikans are wilting before a certain blue. Joshua, I believe your experience commends Fritz-Schimpf. It’s a tough blue to resist. Fritz-Schimpf has been a very reliable retailer for me and they are definitely my personal go-to. I ordered an Iconic Blue from Fritz-Schimpf today for €114.29 (ex VAT), which I think is a fair price. The color of this pen is most attractive. It reminds me of the color of the Aegean Sea and of the blue domes that are so beautiful on the Greek churches in the islands. Also, the term “Iconic” can’t help bringing to mind the icons of the Orthodox Churches in Greece. It is easy to see how cleverly I rationalized this purchase (disclaimer: I am Orthodox, and my wife is a native Greek). I also may have inadvertently ordered an M800 Raden Royal Gold. Don’t tell anyone . . .
My go to supplier. I agree that it is a fair price and that is also what I paid. Yeah, I often inadvertently buy a lot of pens, Radens included. Enjoy your two new beauties! The Raden Royal Gold is exceptional. You won’t be disappointed. Yikes! You guys read German? Does Fritz-Schimpf have an English version? Please direct me. Thanks. They do not have an English version of their website. You should email them if interested. They are all very good English speakers and will handle your request. “Google translate” got me as far as created an account at Fritz-Schimpf and put the pen in the shopping cart. Looks like they charge €30 for shipping. So I just emailed them to see if there is free shipping on purchase reaching a certain amount. Perhaps you know the answer. Blue is my favorite color, will get this one. I believe that is their standard shipping rate these days. Doesn’t hurt to ask though. I know I said I wouldn’t be buying this pen. However, I keep looking at it, and it is very pretty. I love that shade of blue. I’m going to try to ignore all references to this pen now….Well, I’ll try, anyway! Ha! Good luck with that. I learned to stop resisting years ago. Just bought the pen including the ink (gift package) from LCDC with 20% discount code “10YEARSLCDC” their 10th Anniversary coupon & free shipping, paid € 127.94. I think it is a wonderful deal. Hope you guys can make use of the coupon. Good for this weekend. That’s a good deal and about the same that I paid. Probably won’t end up finding it much cheaper shipped than that. Thanks for sharing the deal. Just how limited will this special limited edition be? Maybe compared to the previous green one, if there are some numbers? I mostly focus on Souveräns so know nothing about M120, but this blue is just…wow! I’m mostly asking if you would consider this one to be a daily carry pen or just something to put on a display and inking it would be a sin. Of course I’m exaggerating here, but really wonder if you think this will ever have any significantly greater value or will just be one of many..? The run will be limited to X number of pens but what that actual number is, we’ll never know. This is definitely a daily carry pen in my opinion but I’d say the same of my Toledos. There are no display pieces in my collection. Every pen is fair game for use because that is what they were made for. I would have zero reservations inking the M120. I doubt that the value of an unused piece would increase to the point where it would be a worthwhile investment. If you’re gonna buy one, your best bet is to use it. I have found the green black an excellent writer and perfect daily carry. Will any vintage Pelikan nibs fit this one? Surely a vintage 140, or 400. Not “any” but many. As I had stated earlier in these comments, the M120 will accommodate M2xx, M4xx, 400, and 140 nibs without much of an issue. Received mine today, F nib. Great pen and a stunning colour. Writes beautifully thanks to Niche Pens. Great feedback. Enjoy your new bird! Hey Joshua: now that you’ve received yours (I assume), is the plastic the same as the dark blue m605 special edition, the one they did for the German department store? My Iconic Blue was shipped from Germany on March 16th and, sadly, I’m still awaiting its arrival. I would be happy to comment on the similarity of the finishes once I have it in hand. No word from USPS yet though as to when that might be. thanks Josh. much appreciated. very pretty color, and happy to see they are taking the time to do something new and not taking short cuts. Perhaps if we’re fortunate they’ll do another m101n Lizard that really looks like the vintage lizard celluloid. Love the color and overall design of this pen. The price, however, it’s completely out of proportion. For 240 euros you can currently buy an m600 at amazon.de. As much as I like it, I cannot justify spending that amount of money on a small pen with a steel nib, even if it’s a Pelikan. The M120 is one of Pelikan’s best lower tier models in my humble opinion. It is really only crippled by it’s exorbitant price tag as I’ve pointed out on several occasions. I completely share your sentiments. Something designed from a school pen with a stainless steel neb should not cost several hundred dollars. 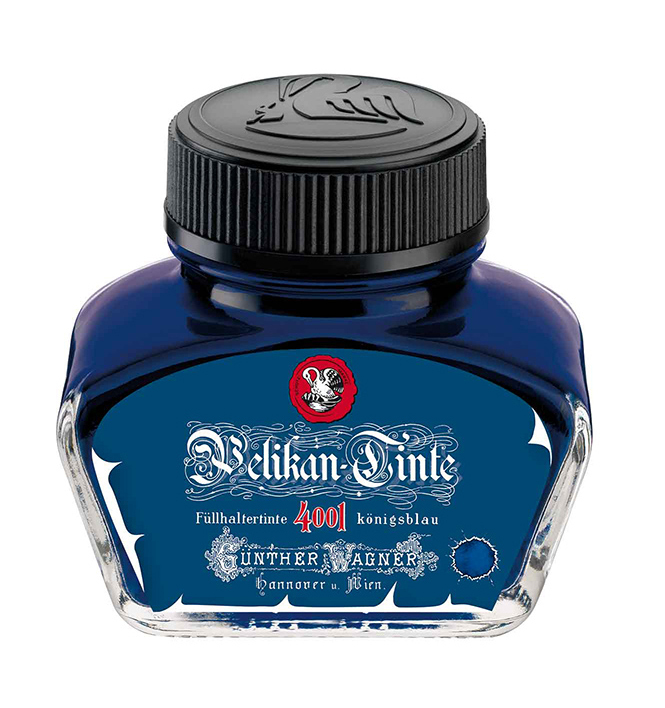 I just ordered this Iconic Blue, how hard is it to change inks since you really can’t get to the piston you flush it cleanly all at once? I saw a trick that using a TWSBI wrench worked on the M1000, do you know if that can also be done on these? You cannot remove the piston assembly easily, nor should you. The nib can screw out to facilitate a quick flushing if you change ink that frequently. No added benefit to removing the piston and only likely to incur damage. Hope that helps.